A quick piece of advice about Delany Blaze and Ashes: skip the credits and listen to the music first, maybe with headphones. Enjoy what you hear because, with the strength of the music, artists, and concept, Blaze and Ashes is a brilliant work, tremendous and entertaining. The concept comes from noted German author Wolfgang Hohlbein's Chronicle of the Immortal; Delany is one of the characters. The idea to put it to music comes from Volker Leson (bass) of German metal band Wizard. Leson was assisted by Davy Vain (Vain, Journey, Van Halen ,etc.) in the songwriting with help from Torsti Spoof of Finland's Leverage. Davy Vain also became producer and one of the lead vocalists (Here Comes Lonely, Planets Turning, Distance of Love). Vain shares the vocal duties with two more powerhouse vocalists: David Readman (Pink Cream 69, et al) on Blood and Ashes, Incarnation, Web Over London, Dead Undead, and London Bridge, and Lana Lane on Love Tears, Eternity Is Yours, and Shadow On Your Heart. This epic cast is filled about by Tommy Rickard (d, ex-Vain), Jamie Scott (g, Vain), Dano Boland (rg, Wizard) and the every amazing Erik Norlander on keyboards. With this talent, enough said. Now listen to Blaze and Ashes again and enjoy. For my money (and with no disrespect to the other participants), the most remarkable aspects of Blaze and Ashes are the vocal arrangements and the production mix. To the former, Readman is stunning on Blood and Ashes and the vocal arrangements on Web Over London's chorus are mesmerizing. Equally brilliant is Davy Vain on the luxurious Distance of Love, a song I could spin ad infinitum. To the latter, the production mix has that expansive clarity and brightness that, well, only David Readman can develop. Other highlights include Lana Lane on Eternity is Yours and the smashing, for both vocals and arrangement, London Bridge. If the Delany project continues beyond Blaze and Ashes (and I hope it does), then we are in for some remarkable music in the future. Strongly recommended! 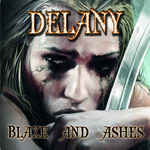 With a superb cast of musicians, epic arrangements, and a fantastical concept, project Delany's Blaze and Ashes is a tour-de-force of magical melodic metal.